When introduced in 1980, the MSI-4260 Port-A-Weigh hanging scale established the original industry standard for accurate, reliable, and safe overhead crane weighing and material handling. After decades of production, added technology advancements, and thousands of worldwide installations, Port-A-Weigh continues to set the standard. 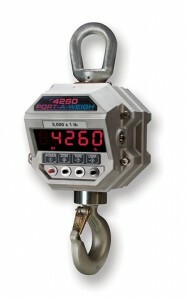 Along with Port-A-Weigh, the MSI product offering features the most complete line of industrial crane scales. If the optional RF interface is installed the weighing data can be transmitted to the MSI-8000 is a wireless remote display for viewing and controlling the functions of the crane scale. One MSI-8000 can communicate wirelessly with up to four compatible MSI devices. For medium to heavy-capacity and duty cycle needs, the MSI 4260 Port-A-Weigh has an established reputation as the industry standard in overhead weighing. This meets or exceeds all industrial safety requirements, including OSHA, ANSI and ASME, and is an economical choice for many bridge crane, foundry, and in-process material handling needs..